I've had this book on my radar for a while, and had been waiting patiently for one of my many local libraries to purchase it so I could check it out. My patience finally ran out, and I decided to buy it myself. Frankly, this is such an important story that I think it's a must buy for school and public libraries and am disappointed that it seems to have escaped the notice of so many of the public libraries near me. The book has been getting some Newbery buzz from the blogosphere (which probably doesn't mean much, given recent Newbery history! ), but it would also be a great candidate for the Scott O'Dell Award for Historical Fiction or the Coretta Scott King Award as well. I get tired of our founding fathers being treated like saints, particularly in literature for young people--they were far from it, being not only men of flesh and blood but creatures of their time. In this compelling novel, Bradley tells the story of slave Sally Hemings' children, widely considered to be fathered by Thomas Jefferson (although some controversy persists despite DNA evidence showing that the Hemmings descendants share common traits with Jeffersons' descendants). The story is told from the point of view of three of Jefferson's slaves--two of whom, Beverly and Madison, were his sons from Sally Hemings, and the third, Peter, the young son of another slave on the plantation who was close to Hemings' children. Although a slave, Sally Hemings herself was three-quarters white, and a half-sister to Jefferson's wife, Martha (who is already deceased at the time this book takes place). Her four children who survive infancy--Beverly, Harriet, Madison, and Eston--know who their father is but are forbidden to talk about it. Their special status means they get special treatment--better clothes, better food, easier work, and even learning to read and write and getting violin lessons, and their mother tells them they'll be freed when they're 21 years old, when they will be able to live as white people. Although they're 7/8 white, and all but one of them can easily "pass," make no mistake, they are still slaves. When a captured slave is returned to Monticello and whipped publicly for his crime, Sally and her children are forced to watch along with all the other slaves. As Jefferson gets older, even those in the slave quarters suspect that his extravagant entertaining at Monticello, his constant building projects, and his love for fine French wines and luxurious goods are leading to greater and greater indebtedness. What will happen when Master Jefferson dies, and these debts have to be settled? The precious words of the Declaration of Independence--and its enshrinement of freedom for all--a copy of which is displayed at Monticello, are surely not meant for everyone, when slaves are another form of property and can be sold away at any time. This story ends with Jefferson's death, and a heart-wrenching slave auction in which families we have come to know in this novel are torn apart. The novel ends with a four-letter word. Sold. An afterword by the author explains what in the book is based on historical fact, and what is made up. She also explains what is known of Sally Hemings' children. Her two daughters apparently married white men, never telling about their past, and their families are lost in history. Madison and Eston Hemings stayed in Virginia until their mother's death, later moving to Ohio and Wisconsin. While many of the details of Bradley's story are invented, she is careful to make the story historically possible. She writes in her afterword, "I have done what I can with what we know now. I've told all the truth I can find; so far as I know, nowhere have I written anything that couldn't be true--that contradicts something we know for sure." As far as I'm concerned, she's done an outstanding job writing historical fiction populated with real characters, some of whom have left little behind in the historical record. We owe Bradley our respect for daring to dig behind the "great man" mythology of Jefferson to share with younger readers a broader perspective on not only his life, but how the institution of slavery impacted one of our most important founding fathers and his legacy. Young people who would like to learn more about what happened to Thomas Jefferson and Sally Hemings' offspring might want to read: Jefferson's Children: The Story of One American Family, by Shannon Lanier (Random House, 2002), a descendant on the Hemings' side of the family. I knew what this was about - and I love reading more historically accurate versions of that time...and after your review, I definitely plan on picking this up! The ending definitely sounds pretty heart-wrenching/intense. This is so fascinating. I saw a TV show about the descendants of Jefferson on the slave side meet the white side. He let the children go free but not the woman who birthed them ... maybe he was afraid she'd leave him?! Thanks for another great review. I want to read this book badly! Having written three books about American presidents, I'm particularly grateful to see Jefferson's Children on the bookshelves. There's much about our "Founding Fathers" that is more myth than reality. Thanks for your review. This is definitely on my must-read list. Oh, dear. My mistake. 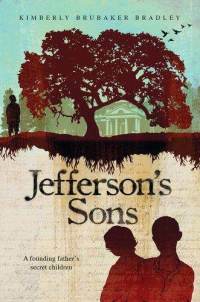 While Jefferson's Children is likely a fine book, I meant Jefferson's Sons! Thanks for the sharing a information about the Books For Children..